If there's one thing I truly love, it's FPS games. Merge an FPS with a space sci-fi setting where you're killing aliens in close-combat and I'm happy. Say hello to Return to Planet X [Steam]. Only realized AA was off after recording, turns out it doesn't save graphics settings when you restart—woops. 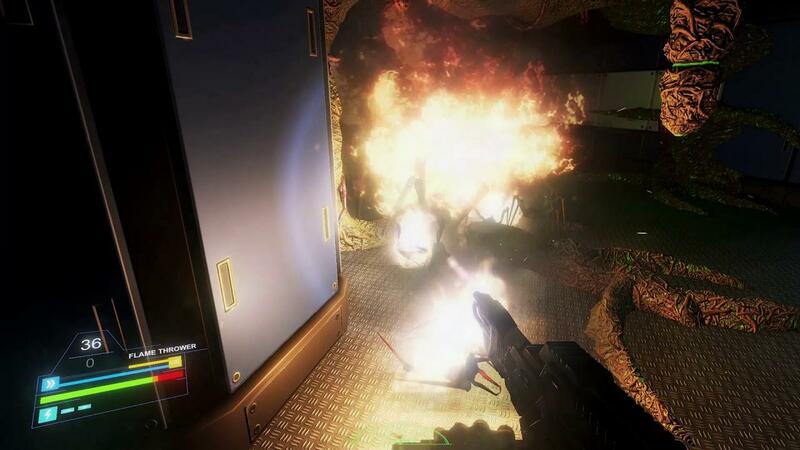 Return to Planet X is a close combat FPS in which you will have to smash tons of alien bugs and shoot your way through the secret military base located on a distant planet. Our game takes the inspiration in action FPS games like Doom or Half-Life and novels like Starship Troopers. Considering the inspiration, I'm not surprised I liked it. I'm not going to make wild claims about it becoming the next huge hit, but considering it's in Early Access it could well end up being a true gem when it's further developed. Honestly, it's like if Aliens: Colonial Marines was turned into and indie game and wasn't completely bloody terrible. It even has the radar with a beep like the Aliens film, which has made me a little happy inside. Even the weapons feel good! They're not the best looking, not terrible mind you, but the sound they give off feels meaty and the way the bullets light up the surrounding area actually looks damn good. I spoke over email with them and they say it is in fact using their own assets, as I know some people dislike "asset flips", so it's not the case here. What we have is a rough around the edges FPS, with some fantastic ideas that I really want to see developed further. With the right tweaks, it could be quite awesome. You can find Return to Planet X on Steam. I wanted to say the assets looks a lot like alone in space. But then again, it's the same developer :-). I hope it has the same wall decorations :-). Reminding me of a first person view of something like Alien Swarm, or Alien Breed. This is a good thing. Seems they're focusing on single player for now, but like the idea of co-op in there later on. I can only hope for co-op eventually, as I think this type of game would really benefit from it, but I do like that it's single player first (mostly because it gives the devs focus rather than spreading their effort around too much at once). One of the few games I'll try keep an eye on, but will likely wait for a bit more development before I buy it (mostly down to lack of time to play games these days, so I'll wait until it's more complete). it seems smooth game with unity engine and developper needs some bigger spideys.. The baddies remind me of the giant crickets in my basement. Otherwise this looks really fun. I can't wait to see it evolve further. Yeah this has a lot of promise indeed.